The practice of cloning is troublesome for many reasons. There are the obvious problems, but beyond those, the fear of a game being perceived as a clone stifles the natural process of building on a great idea. We’ve seen some pretty shameful clones in the App Store’s history, but perhaps none of them have been as harmful to the original game as 2048 was to Threes! ($5.99). A marketplace battle took place, and I think it’s safe to say a lot of people felt the wrong game won there. I’m not sure if the cloud hanging over that has kept more developers from taking a crack at ideas inspired by Threes!, but if it has, more’s the shame. Still, we see the odd swing at doing something interesting with the compelling swiping and combining mechanism that Threes! introduced so well. The latest is Dungeon Tiles (Free), from developer Takashi Iyoda. While it might look familiar enough, Dungeon Tiles has somewhat complicated rules that it doesn’t do the best job of explaining in its tutorial. As in Threes!, you can swipe in one of four directions to move all the tiles on the board in that direction. Each swipe will bring a new piece onto the board, and if you get to a point where the board has no room for another tile, it’s game over. Pieces can merge with specific other pieces if they slide into each other, so you’ll need to manage how you move the board carefully if you want to keep things rolling. The twist in Dungeon Tiles is that you need to watch out for more than just a full board. Here there be dragons, and if they deal more damage than the number of life points you have, you’re toast. The only way to keep them at bay is through the cold, hard steel of a bunch of swords. There are four different basic tile types in Dungeon Tiles. Matching tiles earn you points, and as usual for this kind of game, a high score is the primary goal. Each type of tile can only merge with its own type, and if you match three or more at once, the tiles will be cleared from the board completely, rewarding you with extra points. The type you need to keep the most careful eye on is the dragon. Whenever you merge two dragon tiles, you’ll take damage. 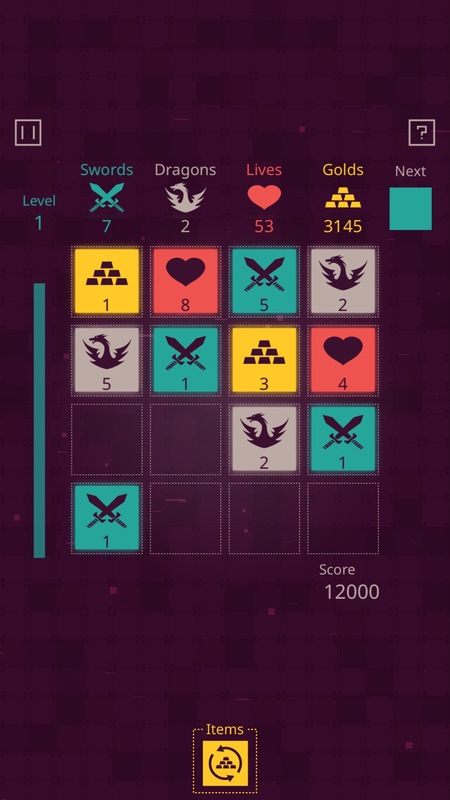 The more dragons contained in the tiles, the more damage is dealt when they merge, so you’ll want to be extra-careful about slamming them together. The second type of tile is the sword, which is used to defend against dragons. Merging swords together destroys any stocked dragons, mitigating or outright nullifying the damage they do, depending on how many swords you have versus how many dragons. If you have to merge any large groups of dragons, try to merge some swords at the same time. The third type of tile is the heart, which upon merging adds life points to your stock in the amount shown on the tile, while the fourth type of tile grants you gold that can be used to buy special items. There are a few other tiles you might come across if you survive long enough, too. Almost all of those are bad news. The presence of the dragons means you can’t just focus on matching up tiles. You need to always be mindful of how many dragons you’re going to generate while matching other tiles, and try to put together either enough health or enough swords to survive. If all else fails, you can take the nuclear option of buying some help from the shop using your gold, but the price of items is quite stiff relative to the amount of gold you’ll typically bring in. The game is tough, especially at first, but once you get the hang of it, it’s a nice variation on the more relaxed gameplay of Threes!. Dungeon Tiles has one more excellent trick up its sleeve, as well. There’s a head-to-head mode for two players that divides your device’s screen into two smaller play areas. 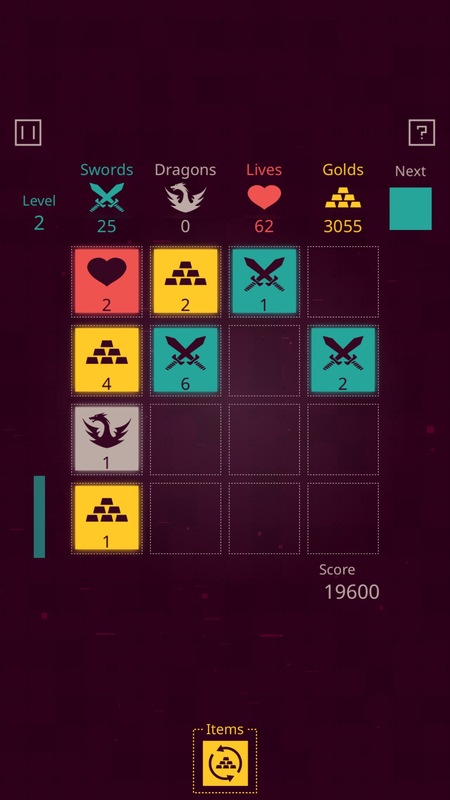 Players take turns making moves, and in classic puzzle game style, you can choose to play defensively or take the fight to your opponent to try to make them mess up. Matching up three or more swords in this mode will generate a dragon tile on your opponent’s side of the field, while matching up gold will create a locked tile they’ll have to deal with. You don’t have to attack your opponent, of course. You can just focus on trying to get a higher score than them. But it’s awfully fun to throw a wrench into someone else’s well-laid plans. The game is free to play with ad support in the form of banner ads between games and incentivized videos. You can buy a $2.99 IAP to remove the ads, but as long as you don’t mind the ads, you’re not missing out on any content if you choose to play for free. 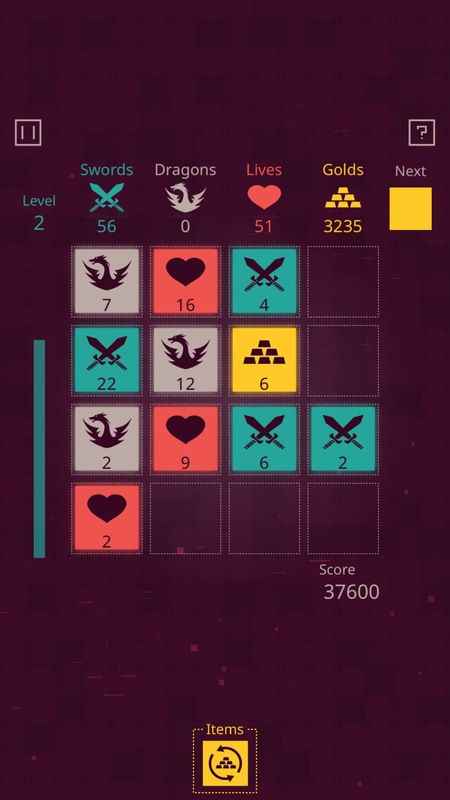 Dungeon Tiles has support for three different leaderboards, tracking score, highest level reached, and accumulated gold, and also includes a selection of Game Center achievements. Beyond that, there aren’t a ton of options, but the game is playable on Apple TV if that’s your jam. 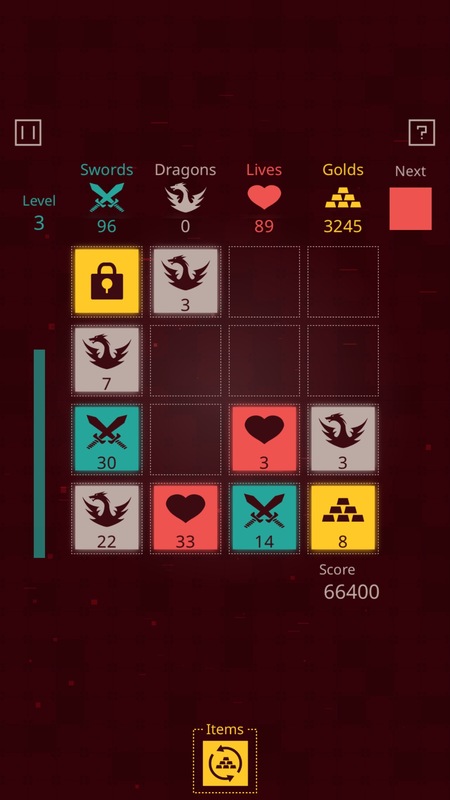 Dungeon Tiles is a fun, tricky variation on Threes!, and it’s one that’s certainly worth checking out. The balancing gets a little shaky as play sessions wear on and your level rises, but apart from that, everything here is fairly well put-together. It takes a pretty familiar mechanic and forces you to think about it in completely new ways, and the two-player mode is an awfully good time. It’s not as slick as its inspiration, and its more complex rules will likely turn some off, but it’s certainly worth giving the game a shot to see how you take to it.